Today's snack bento only contained mini pocket sandwiches and fruits. I put pork floss and sesame seeds with butter inside the mini pocket sandwiches. The size of this Melody box is not too big so it is perfect for snack bento. Tomorrow I will post some of my bread mold / bread cutter collections. I use them to prepare kids' breakfast. As you can see from my lunch bento, I rarely put bread / sandwich inside kids' bento. Only because I prefer they have rice for lunch and bread for breakfast and afternoon snacks. This snack bento was easy to prepare, only took 15 minutes. Can't wait to see your sandwich cutter collections, I'm sure they'll wow me again! Lia, your mini pocket sammies are so perfect! I could never get the seams to close properly each time! @Angeleyes : Thanks a lot Alice! Is the bread too dry or what? can't believe you made this one so quickly, it still has so many wonderful details! your sammie pockets came out perfectly -- sigh, need some tips from you, mine never stay sealed. love the four-leaf-clover shape on the kiwi, and the funny bunny face, too! @Asfora : Thanks a lot Asfora! @megan : Thanks a lot Megan! Don't want to spend so much time for this week snack bento hehehe ... *lazy lazy* I'm curious now because Alice from Bento Fun also have the same problem with you. 15 mins?! I think I'll take the whole morning to do this! can't wait to see your mold and cutters! @pigpigscorner : This one was really quick. I will call it my 'lazy' bento hehehe :D Thanks for your kind comment! @purple angel : Thanks a lot Sysyl for your sweet comment! As always, I love your bento, the way you arrange things are very details. The color combination and everything, perfecto!!! whoa, how cute is that pocket sandwich!? I love it I love it!! It never looks this clean and nice in pictures from online stores, but yours look so fab! Looking forward to your bread moulds! Lia, even your quick bentos are fabulous! Love the mini bunny sandwich! Lia, mau tanya.. itu yang di Rotinya keju-kan ya? Kok bisa nempel dan g jatuh? Direkatin pakai apa ya? TengQ, tengQ.. So perfect and pretty! Love the tiny sandwich squares. Never tried to make my own, maybe I'll learn from you tomorrow, hehe! Your blog is so handy and informational! Thanks for all the tips and cute bento ideas lia! @notabrownbag : Thanks a lot Mils! @sherimiya : Thanks a lot Sheri! @Mochachocolata Rita : Thanks a lot Rita! Comment from Pauline (Pipaw) via e-mail : Hi Lia! wow I love today's bento. 15 minutes and it is still adorable: is this magic? @Rachel Hei : Agree with you. Kids love it too :) Thanks a lot Rachel! 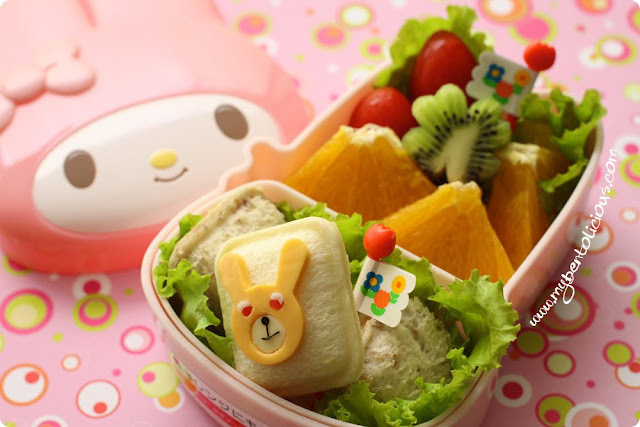 Cute snack bento. I love the rabbit and the kiwi. Looks like you used a whet bread on the bottom pocket sandwich. I didn't know it would work with that. Great job! @gnoegnoe : Thanka a lot Gnoe!